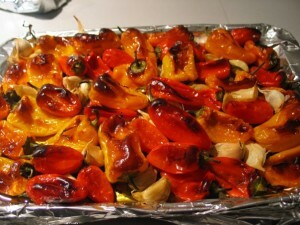 Roasted Mini Peppers and Garlic - Kosher In The Kitch! Roasted Mini Peppers and Garlic - Kosher In The Kitch! This is for Moroccan salad. Lay the peppers and garlic (whole cloves with peel still on) on the pan. drizzle all over with olive oil and sprinkle salt all over. roast in oven on 400 degrees till they get this color. put in tightly sealed container and lasts for a few weeks. delicious. this is so easy and taste amazing!!! i also added fingerhot peppers. How many or what weight of peppers and how much garlic? In this recipe, a full bag from costco and a head of garlic was used. I used a full bag from costco with lots of fresh garlic. I removed the stems and there were hardly any seeds. It was easy and great!